Dr. Willis taught Je Rinpoche’s Three Principal Aspects of the Path at the Abbey in 2017. You can watch the videos of her teachings. While Traveling through Asia during the early 1970s, she encountered Tibetan Buddhism. Inspired by her spiritual teacher, Lama Thubten Yeshe (who was also one of Ven. Thubten Chodron’s first teachers), she pursued academic life, receiving a BA and MA degrees in philosophy from Cornell University and a Ph.D. in Indic and Buddhist Studies from Columbia University. 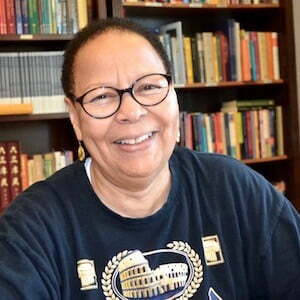 Renowned as a story-teller as well as a scholar, Dr. Willis is the author of several books on Buddhism, and a personal memoir, Dreaming me: Black, Baptist, and Buddhist – One Woman’s Spiritual Journey. She has admired and studied Lama Tsongkhapa’s work for decades and came to the Abbey to share her insights and experiences.